Mithras and "Mithraism" enjoy a popular following unique among ancient mystery cults. In some cases this has led to the wide circulation of ideas now outdated, even, sometimes, among professional scholars whose specialism is elsewhere. For this reason it is invariably good practice for the reader to check the ancient data first, and then evaluate whether the claims derive from it, are speculatively based upon it, or (sometimes) apparently imaginary. Only modern specialist scholars should be used as reference sources. The following questions seem to be frequently asked. This page will be updated as seems necessary. 1. Is Mithras the same as Jesus? 2. Is Roman Mithras the same as, or derived from, Persian Mithra? 3. Mithras in Commagene? Was Mithras worshipped at Nemrud Dagh? 4. Pre-Roman Mithras? Did Mithras exist before he appears in Rome? Perhaps in a different form? 5. Did the cult of Mithras celebrate the Taurobolium? 6. Isn't Mithras mentioned in the bible? 7. Is David Ulansey's book, "The Origins of the Mithraic Mysteries: Cosmology and Salvation in the Ancient World", reliable? 8. Is the Wikipedia article reliable? 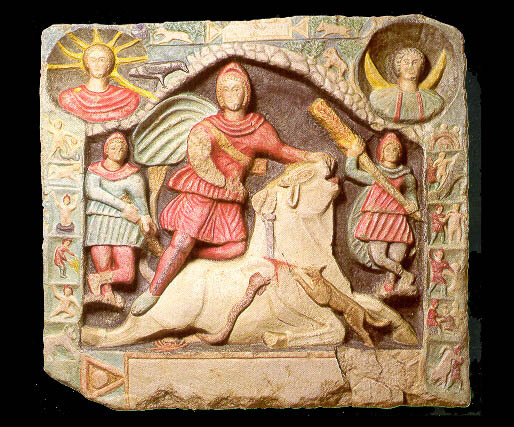 of Mithras killing the bull. No. The points of similarity may be found in the Mithras and Jesus article. The key problem with Cumont's thesis is that Persian Mitra is not very like Roman Mithras, once you ignore the similarity of name. The Persian deity is not associated with the killing of the bull, a motif central to Roman Mithras. Likewise the cult of Mithras has very distinctive archaeology, notably the temples or Mithraea, yet there are no Mithraea in Persia. In fact there are very few in the Greek-speaking world; the Mithraeum is built where Romans settle. The archaeological pattern shows an origin in Rome, spreading out with the legions. This is, as far as the evidence goes, a Latin cult. First, Plutarch says that the cult was practised by the Cilician pirates in 68 BC, and in Rome to his own day. Unfortunately the archaeology for Mithras in Cilicia, exposed since Cumont's day, is nearly non-existent, and is entirely late. This cannot be a cult centred in Cilicia, therefore. Secondly, the name of the deity is clearly the same (more or less) as the Greek translation of the name of the Zoroastrian-Persian deity. Likewise the presence of the name "Areimanios" in inscriptions is the same name as the Greek version of Ahriman. Mithras is depicted in Persian dress, particularly in the frescos at Dura-Europos. Mithas is the "Persian god". Unfortunately these links are not enough to establish any connection between the two. Nor is it unknown for oriental motifs to be borrowed by the classical world to create faux-oriental items. The Graeco-Roman Zoroaster literature is not connected to any genuine Zoroastrian texts, or even Zoroastrian teaching, but is a composition featuring the ideas of the Greek world. The appeal of "Oriental" material in the ancient world is paralleled by the Edwardian interest in Fakirs and the hippy movement of the 1960's. The problem faced by scholarship is that we have very limited information about the origins of the cult, and none about its founder. We know that it appears in Rome, some time in the second half of the first century. We know that it features oriental names and motifs. But we find no other connection to Zoroastrianism. It has been hypothesised that the cult was founded by people who lived in the Greek-Persian borderland, perhaps in Asia Minor, perhaps in Commagene even. The suggestion is that these people borrowed some of the oriental ideas, and created a cult around them. It is possible that this is correct. But there is no actual evidence of this. The curious mountain temple at Nemrud Dagh in Eastern Turkey (CIMRM 28), once part of the kingdom of Commagene, includes a series of monumental heads, labelled with names. Each head is given two or more names. One of the heads (described as CIMRM 29 by Cumont) is labelled as "Apollo-Mithras-Helios". Others are labelled Zeus-Ahura-Mazda, and Ares-Artagnes-Heracles. One of these is from the Greek pantheon - Zeus, Apollo, etc. The other is from Zoroastrian mythology. So this is not a temple involving Roman Mithras; the deity "Mithras" here is the Zoroastrian deity, here identified with Apollo or Helios. There is no Mithraeum at the site; no sign of the tauroctony present in every Mithraic context; and, far from being underground, the temple is atop a mountain. This site, therefore, belongs to syncretism. It is a one-off site, created by Antiochus of Commagene, a hellenised ruler of a largely oriental state, as a means to draw together the disparate elements in his ramshackle kingdom. The cult of Mithras first appears in the literary record with Statius in 80AD and in the archaeological record after 100 AD. Claims that it existed before this time are, therefore, based upon no evidence (but see above for qualification of this). Statius refers to what is recognisably the cult known to us; the archaeology of Mithras is very distinctive and appears with the first underground temples. So what do those amateur writers who talk about a "pre-Roman Mithraism" mean? Invariably they mean one of two things. Either they wish to suggest that there is a connection between the "Mithra" of the syncretistic Commagenian temple at Nemrud Dagh and the Roman deity Mithras. Or they wish to suggest that there is a connection between the ancient Persian deity Mithra/Mitra, and the Roman cult. Both of these questions are dealt with elsewhere in this FAQ. 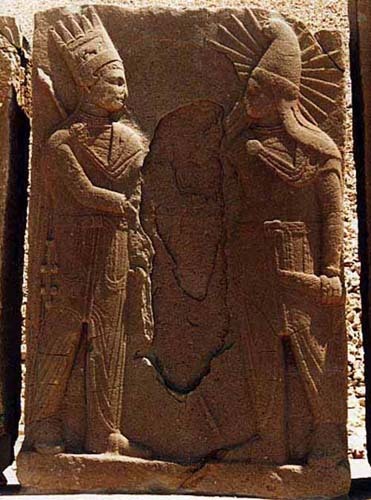 The "Mithra" of Nemrud Dagh is the Persian deity Mitra/Mithra, not Roman Mithras. There is no real evidence of any connection between Persian Mitra/Mithra and Roman Mithras; while the two were supposed to be the same by the great Franz Cumont, this opinion is not held by scholars today because the archaeology contradicts it. It is entirely possible, and perhaps even probable, that there were cultists of Mithras prior to our first evidence of them. It is possible that the cult may have been manufactured elsewhere than Rome; but if so, it has left no known traces. But we can only speak based on the data in the historical record. There is no evidence of anything recognisable as Mithras prior to 80 AD. To say otherwise is to write fiction. Some attempts to argue that Mithras existed in a pre-Roman but different form tend to be merely attempts to dodge the testimony of the evidence. In each case we have to ask what, if anything, is Mithraic about the supposed ancestor monument or literary reference. In each case the answer is "nothing". See also Was the taurobolium associated with Mithras? "There is a possibility Mithra(s) is mentioned in the Bible. In Ezra 1:8 and 4:7 you can find the name Mithredath, which has the meaning "gift of Mithra"; Mithra the Persian form of the Roman Mithras." The name "Mithradates" in various forms is common in the Near East. But it is not connected to Mithras. Instead it derives from the Indo-Persian deity Mitra/Mitha. The name appears in the Near-East along with the Persian empire and its state religion, Zoroastrianism. Scholars originally believed that Roman Mithras was a version of this ancient deity; but ever since 1971, it has been clear that this is not so. The archaeology for Mithras is very distinctive, and commences ca. 100 AD, centred on Rome. It seems clear that the name "Mithras" was borrowed from Persian mythology, as was "Arimanius", and the cult presented itself as "Persian", as we know from literary sources. But rather like the fake "oriental" cults of the 1900's, or indeed of the hippy era, the connection with real eastern religion is more a matter of colouring than content. David Ulansey is an academic, unlike some writers widely read on the internet.3 His book, The Origins of the Mithraic Mysteries: Cosmology and Salvation in the Ancient World,4 has become widely known, and articles by him are accessible online. It is partly based on his 1977 PhD thesis (from Princeton). Some portions of this repeat some of the Cumontian ideas, which were in fact losing favour at the time. Like many other contemporary scholars, he believes that the explanation of the tauroctony should be seen in the sky, that the reliefs depict a star-map. His interpretation is idiosyncratic, however, and has not been accepted elsewhere, and has been reviewed rather harshly. Another suggestion, that "Mithras" is merely the name used outside the cult for Perseus, does not seem to have attracted the same attention. A review may be found here. 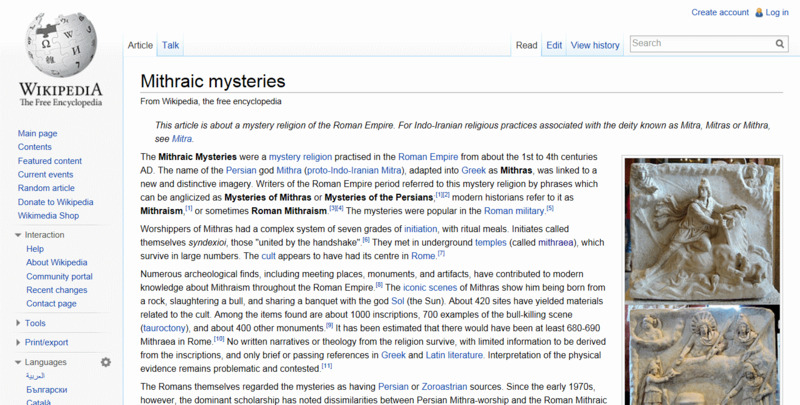 The most referenced source online about Mithras is the Wikipedia article currently (2014) named Mithraic Mysteries. It is the first hit on every search in Google, and whatever statements it contains tend to be repeated uncritically around the internet. The history of this article is interesting. It is in the interests of no honest person to propagate factual errors about Mithras, and the defects of the Wikipedia article have annoyed various educated people enough to make them intervene, since at least 2006. I have seen several attempts to fix it, all of which proved futile. Readers may not be aware why this is. It is an open secret that experts cannot edit Wikipedia. It is less well-known that the bullying culture in Wikipedia means that attempts to improve articles invariably end badly for the expert who tries. My efforts to introduce extensive references and quotations between 2009-11 were all, in the end, counter-productive, and all that work was rendered useless by one troll and his enablers.5 Had I not done so, the article would most likely resemble the article on Persian Mithra, which I had intended to research and work on in the same way. It is ironic, that those who are most "certain" that Mithras and Mithra are the same, take so little interest in the latter. Currently (February 2014) the article is currently quite unreliable. A troll in 2011 fought an edit war to gain control of the article and then made some 500 edits, all of them introducing unscholarly or exploded ideas, deleting scholarly statements, and so forth. As far as I am aware the troll and his allies are still in possession of the article; Wikipedia has no mechanism to deal with such situations. The article is riddled with problems, and does not reflect the state of modern scholarly opinion. The material on this site is mainly new. Initially I took the last version of the Wikipedia article mainly written by myself, as a basis, since I knew that the referencing was sound. But I was reluctant, on my own site, to take as much on trust as I had at Wikipedia. These doubts about material from Wikipedia have proven well-founded. I have rewritten a great deal, revised, and rechecked; and omitted material not passing my quality tests. I hope that I have now removed all the errors. But errors there must certainly be; of fact, and of judgement. Corrections to and comments on the material on this site are very welcome. Please use this form to contact me. 1 Roger Beck, "Merkelbach's Mithras" (Review), Phoenix 41, 1987, 298 (JSTOR): "Rightly gone--we shall probably never see it again--is Cumont's old view of Mithraism as "la forme romaine du mazdeisme" and his reconstruction which found in its gods and powers the barely metamorphosed counterparts of the Iranian pantheon." 2 Roger Beck, "Mithraism since Franz Cumont", in: Aufstieg und Niedergang der römischen Welt, II.17, 4, Berlin: Walter de Gruyter, 1984, pp. 2002-2115. p.2026: "There is no evidence that the Mithraists as such ever performed that rite, and a priori considerations suggest that a mithraeum – any mithraeum – would be a most impractical place to attempt it." 3 The personal home page of Prof. David Ulansey may be found here. 4 Oxford University Press. Revised edition 1991. 5 This is not the place to document the squalid methods, well known to all the regulars in Wikipedia, whereby all the real contributors to the Wikipedia Mithras article were evicted from the article or the site. The process revealed a "lord of the flies" type environment, with nobody really in charge and no sense of right or wrong by anyone. The owners of Wikipedia ensure that the pages on which such activity takes place are not indexed by Google, thereby hiding much of the evidence. The reader is referred to the Wikipediocracy site which contains much thought-provoking material. The Wikipedia essay on Randy in Boise (retrieved 30th Nov. 2013) is, sadly, all too true.